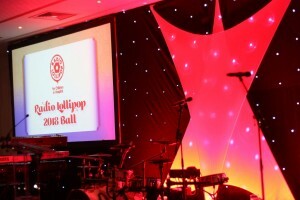 Last month, Aquarius staff attended the Radio Lollipop Ball held at The Principal Charlotte Square, Edinburgh for the fifth year. We are always thrilled to attend this fabulous event and are proud to give our support to such a fantastic cause. Year after year, the Radio Lollipop Ball does not disappoint, and this year was no different. Guests were treated to an Arabian Nights theme this year, complete with Belly Dancers, props and a fabulous after dinner cocktail. Previous themes have included The Great Gatsby, Sporting Heroes and Hawaiian to name but a few, all wonderfully thought up of by the Radio Lollipop team in Edinburgh. So why do we support Radio Lollipop? Radio Lollipop is an international charity organisation founded by Sir Hedley Finn in 1979 to provide care, comfort, play and entertainment for children and young people, primarily in hospitals. Since the very first Radio Lollipop went o n-air on 5th May 1979, there has been an international expansion. Radio Lollipop now has a presence in America, Australia and New Zealand as well as the UK. This is a testament to the good work they do, and the difference they make to the lives of children that have previously stayed and are currently staying in Children’s hospitals. Another reason that Radio Lollipop is close to our hearts here at Aquarius, is that a large amount of our staff are parents. As we are one of the few companies in the UK to offer home working, this enables parents to work flexible hours from the comfort of their own homes. Some of these staff members have children who have spent time in The Sick Kids Edinburgh, for various reasons. They know only too well that the fun and laughter that the Radio Lollipop Volunteers provide, gives families some escapism, which is often much needed under difficult circumstances. We are very proud to say that Aquarius this year alone has donated £3,500 to Radio Lollipop. We sincerely hope that this will help the charity continue its invaluable work across the world, and more locally, help the Edinburgh team move into their new home. We very much look forward to providing our continued support in the years to come. Finally, we would like to thank the Edinburgh team- Elaine Craig, Graeme Barr and Sir Hedley Finn – for such a wonderful event. A fantastic time was had by all. We are already looking forward to next year!